Via Pixelsumo comes a fantastic lineup of links to futuristic interfaces for music, etc. If you were impressed by Cycling 74’s new Lemur touchscreen, with the power to let you touch multiple points on a pad simultaneously for controlling music/sound/etc., Jeff Han has built his own. 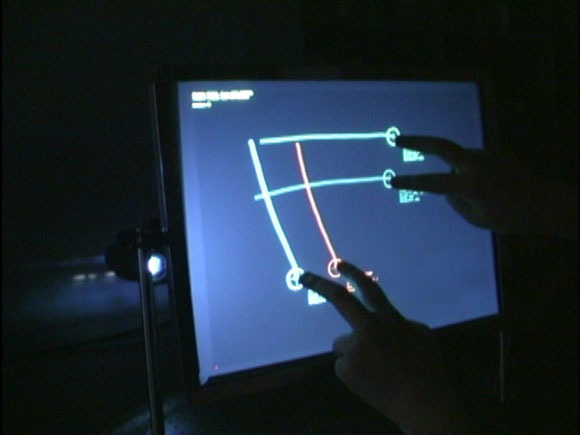 His Frustrated Total Internal Reflection project may sound like some sort of existential experience, but it’s really an optical system for tracking multiple finger touches on a screen. You need a back projector, so it’s not as portable or compact as the Lemur, but watch the video: extremely low latency, extremely high sensitivity. Jeff has other tricks up his sleeve, too: using LEDs for touch control, and volumetric 3D displays using dust, among others. I’m heading to NYU later this week, so I’ll have to see if there’s something in the water. If you’re at Siggraph, go check these out and let us know more!